As covered in the earlier articles of this series, the Kogami version achieved an almost flawless version of the undub. 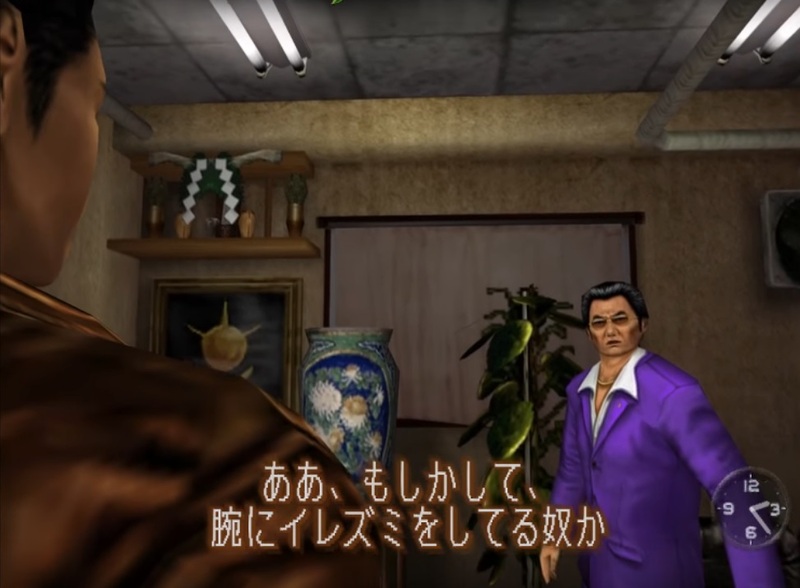 However, while the English subtitle translations, which were extracted from the "US Shenmue" release, were sufficient to replace almost all of the Japanese text with English, there were a small number (approximately 3% of all subtitles by volume) that did not have equivalent lines available. Hence during play, occasionally a subtitle line is displayed that is still in Japanese. The majority of the subtitles in the Kogami undub show in English, but there is the occasional line of Japanese text. While these subtitles occur in places that are not crucial to the plot, their translation is something that would be nice to provide a complete undub experience. And while we are creating an updated version, there is also the opportunity to fix any other little issues that might be noticed at the same time. People who have been involved with modding or hacking Shenmue in the past will probably be aware of a customized set of fan-built tools called the Shenmue Translation Pack (or "ShenTrad"). These tools understand the underlying format of various files that make up Shenmue 1 & 2, and allow you to modify and replace things like subtitle text and graphic textures, so that the updated files can be recompiled into a new disc image. These tools were used with the files in the Kogami undub disc images to replace the remaining Japanese subtitle text with English translations, one line at a time. 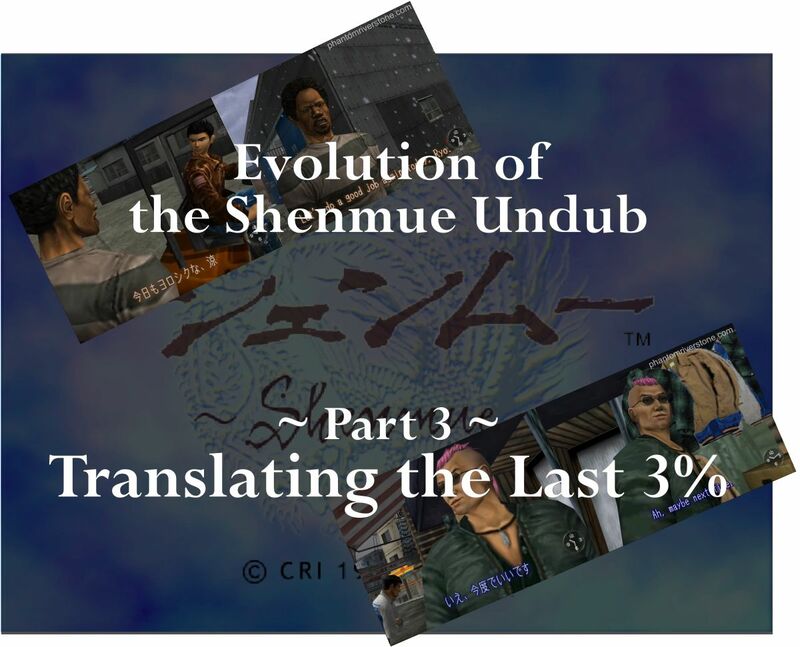 Tools from the Shenmue Translation Pack were used to update the subtitle text. Next, let's look at what changes and fixes have been made for the 100% Translated version. The bulk of the effort was spent on providing English translations for those subtitle lines that were still in Japanese. These untranslated lines were scattered throughout the three discs, for various characters. The main consideration here was to ensure that the translations sounded appropriate in the context of the conversations in which they would appear. Practicing moves in the parking lot. Ryo is not interested in buying jeans. Forklift race is over, time for work. The Shenmue games are no stranger to odd phrases in its English translation - such as the legendary "Especially since you bought merchandise". Many are now iconic phrases that have become so much part of the fabric of Shenmue, it would be a shame to correct or remove them. However, some minor fixes have been made along the way, such as these examples below. Weird English #1: "Please tell me the Gamble." When Ryo visits the fortune-teller in Dobuita, he is given a choice of topics on which to have his fortune told. Due to the limited space on-screen for the user interface in the game, these are short keywords: "Future", "Clue" and "Gamble". If Ryo chooses the last option, he momentarily forgets his grammar and comes out with the awkward-sounding "Please tell me the Gamble". This has been modified to a slightly more meaningful line. Left: Ryo forgets his grammar. Right: the revised line. Weird English #2: "Bikerful, Ryo." During Ryo's fourth day at work at the harbor, Mark has some information for Ryo about the Long Zha. Mark is also concerned for Ryo's safety, telling him gravely: "Bikerful, Ryo". Huh? The audio track confirms that Mark is actually saying "Be careful", but for some reason the pronunciation has been transcribed rather literally. This has been corrected. Left: is Mark praising Ryo's motorcycle driving skills? Right: amended version. Weird English #3: "Un, but I won't let this go." After Ryo has rescued Nozomi from the Mad Angels and they are about to ride home, Nozomi thanks Ryo for rescuing her. He replies "Un, but I won't let this go." The word "Un" here is a sound that is common in Japanese as an affirmative response or a casual acknowledgement, but not in English. I've changed this to "Mm". Left: Ryo says "Un", but it's not common in English. Right: the modified line. In a past blog post we talked about a small but vital mistranslation in the official English line where Master Chen talks about Lan Di's position within the Chi You Men (see: "Is Lan Di the Leader of the Chi You Men?). This has now been corrected for the Undub to ensure it matches the meaning given by the original Japanese-language line. A subtle but significant different: Master Chen's information about Lan Di has been corrected to match the meaning in Japanese. A strange (but small) glitch is present in the Kogami release to do with Ryo knocking on the doors of people's homes. It turns out that when an NPC replies to Ryo through the door, the conversation does not play out properly. The result is some puzzling conversations due to out-of-sequence lines of dialog, and sometimes even a mixture of NPC voices (when there should only be one person answering the door). The issue can be seen in the video clip below. The cause of the problem was able to be traced back to the fact that the Undub is built on the files from the PAL version of Shenmue, but with certain files, such as those relating to audio and subtitles, being imported across from the NTSC (Japan) version. One particular file that controls the flow and sequences of these "door knocking" conversations is located in a different area of the disc from the others, and this file had not been updated. Replacing the PAL version with the corresponding file from the NTSC version resolved the issue. The Kogami Undub had already swapped out the alternative brandings for the soda cans and vending machine (such as Bell Wood's Fruda Grape and so on) with the official Coca Cola branding as found in the Japanese version of the game. There was just one specific scene where this was not the case: during the motorcycle "chicken race" with the Mad Angels at the harbor, the can that is tossed to signal the start of the race still showed as a Bell Wood's Jet Cola can. The texture file has been updated to Coca Cola branding for consistency. Left: the can being held is a Jet Cola. Right: after texture replacement, the can now has Coca Cola branding. The latest disc images for the 100% Translated Kogami Undub are now undergoing final testing (Shenmue Dojo & Shenmue Lounge being among those who are or have been streaming it on their channels and have kindly provided feedback). A release date has not yet been set, but any updates will be posted to the blog! A special shout out to Shendream who proposed this project and is himself working on a French-language Undub version - keep an eye on the Shenmue Master site for news on the French version. Loved this! Thanks so much for taking the time to illustrate changes. Would anyone know where I could find the Japanese dialog online? Does anyone have any news on when the 100% Shenmue Undub will be released? I saw that it was mentioned in the article and that it would be soon, but how long exactly, a few months? Thanks for your interest - as a rough timeframe, we're planning to release it within the next few months. Can't wait for that, gonna be so awesome! Will there be a 99min version and will it be the same as the current 99min version, no downsampling or anything cut? Yes, it will be a 99-min version at the least (since it's based off the kogami 99 min release). Reducing the size to fit onto 80-min standard CDs without downsampling or cutting content will also be looked into, although it's not guaranteed at this point. Any update on the release date of this? It's looking likely that the release period will move to the second half of the year. As a quick update: thorough testing under emulation (Demul) is complete, and an 80-minute version has been produced by the Shenmue Master team. The final task remaining is testing on real hardware, which is getting underway now. This is incredible work. Thanks for the effort! Been waiting for this forever. Thanks for your comment - we're getting there! I just thought about this. Am I going to have to start the game over or will my normal ntsc-u still work with this? Probably a dumb question, but let's be honest, Shenmue is a very time-consuming game, I'd hate to have to restart. It's a good question but unfortunately that only PAL save files are compatible with the Undub, as it's a PAL-based build. Darn. 😕 I don't assume there's a way to convert it to a PAL save...? I think there is a tool or hack around that will let you convert to a PAL save, at least if you're playing on an emulator. We'll keep it in mind! Comment away, and thanks for your interest. But also please see an important update message about the release which I will add as a separate comment on this post. Thanks to everyone who has been following the progress of this project. As you will be aware this week Sega has announced the Shenmue I & II re-releases for release in 2018 which should allow players to play an "Undub" officially. As a result, and out of respect for Sega coming to the party, the project team is reconsidering the 100% Undub release timing and plans for its release have been put on hold for now. At the same time a lot of work has gone into the project, and I'll update again if there is further news. Thank you for your understanding. I'd love for them to continue this and I doubt they'd change the weird english lines, that and the Coca-Cola appeal to me as these are not likely to be in the HD release. We are currently looking into the possibility of importing the translations into the Shenmue I & II release for play on the PC version. So no dreamcast undub version? A plan is also being worked on for a Dreamcast version, but there's nothing concrete to report just yet.